An 83-year-old woman with a medical history of hypertension, chronic renal failure, and diabetes mellitus came to the emergency department of our clinic after 2 days of fever, asthenia, adynamia, and hypogastric abdominal pain associated with dysuria, polyuria, and bladder tenesmus. Her family reported that she had been increasingly fatigued in the several days before presentation, and she had been experiencing hematuria as well. On physical examination she was in a regular general state, dehydrated, hypotensive, sleepy, and febrile, with tenderness to palpation over her lower hemi-abdomen, predominating in hypogastrium but without signs of peritoneal irritation. Significant laboratory results included hyperglycemia of 578 mg/dL, mild leukocytosis (11,700 cells/mL) with a left-sided deviation, and creatinine level of 3.2 mg/dL, associated with abnormal results on urinalysis (pyuria, hematuria, and bacteriuria) and a urine culture in which Klebsiella pneumoniae extended-spectrum β-lactamase was isolated. A hyperosmolar state was diagnosed, and aggressive rehydration was started, in addition to empiric antibiotic treatment with ertapenem according to local guidelines. 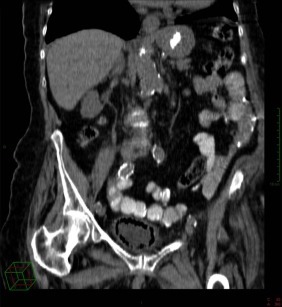 A urethral catheter was placed, and the nurses noted pneumaturia; then suspecting a colo-vesical fistulae, a computed tomography scan of the abdomen was performed, which showed images of gas within the bladder (Figure).